St. Edward (OH) defeated North Mecklenberg (NC) 59-57 to advance to the consolation bracket championship game of the 2018 Beach Ball Classic at the Myrtle Beach (SC) Convention Center. St. Edward will now face Florence (MS) in the consolation bracket championship game on Monday at 1:45 p.m. TURNING POINT: Trailing 57-52 with 3:29 remaining in regulations, Montorie Foster hit a short jumper and then Devontae Blanton connected on an old-fashioned three-point play to tie the game at 57-57 with 2:08 remaining. Grant Huffman netted the winning free throws for the Eagles with 39 seconds remaining. Trayden Williams’ attempted tying jumper at the buzzer was blocked by Huffman to preserve the victory. ST. EDWARD STAT LEADERS: Grant Huffman’s 13 points led the Eagles while Devontae Blanton chipped in 12 points and Montorie Foster grabbed 11 rebounds. 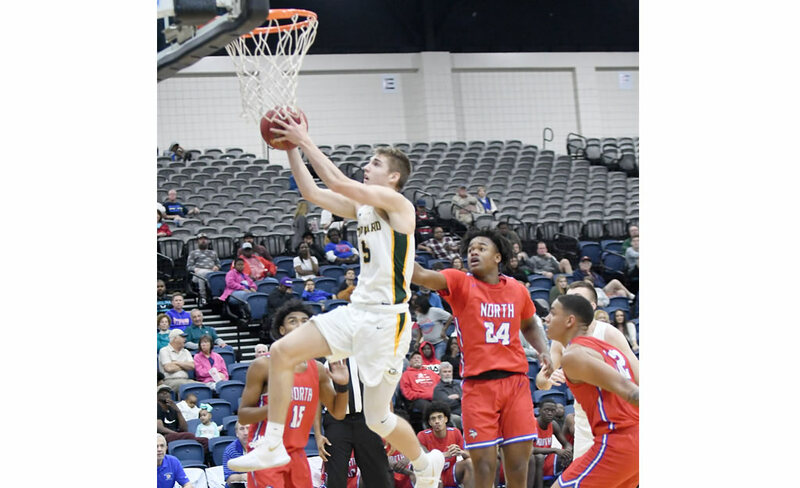 NORTH MECKLENBERG STAT LEADERS: Tristan Maxwell paced North Mecklenberg with 20 points and six rebounds..
RECORDS: St. Edward 5-3, North Mecklenberg 9-2. WHERE ARE THEY FROM: North Mecklenberg – Huntersville, NC. St. Edward – Lakewood, OH.